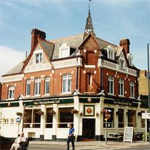 Situated in the heart of Twickenham, the Tup here is a big sports venue with rugby being a substantial theme. A natural meeting place before and party-pub after all the major rugby matches. If you can't get a ticket to the match you can still enjoy the atmosphere and watch the match on the two Giant Screens. You will find a barbeque outside and an all day party inside. Twickenham has a beautiful bar and it also serves Tup roasts on Sunday and a wider menu at all other times.